The bossa nova phenomenon infused jazz and popular music with fresh ways of thinking about rhythm and about story telling through music. It arrived when rock and roll was firmly established, the Beatles were beginning to dominate music on the radio and hardly a week passed without another boy band taking its place in the pop firmament. Brazilian music was a distinct contrast and, to many, a relief. Fortunately, it has remained a small but rewarding strain in popular music and a vital part of jazz. The past few months have seen a profusion of recordings by Brazilians and others who are captivated by the music that half a century ago swept from Brazil around the globe. The pianist and singer’s latest tribute to her native land begins with “Brasil (Aquarela do Brasil)” and ends with “No Tabuleiro de Baiana,” both by Ary Barroso (1903-1964), Brazil’s patriarch of modern popular songwriting. It is to Elias’s credit that the six new songs she wrote for the album keep comfortable company with those by Barroso and two other heroes of Brazilian music, Antonio Carlos Jobim and Roberto Menescal. Menescal blends his voice with Elias’s in his classic “Você” and backs her on guitar in that piece and his “Rio,” both augmented with a string orchestra. The sessions include rhythm players from Brazil’s corps of talented musicians. Mark Kibble and the vocal group Take 6 provide background vocals for a lush version of “Waters of March,” the first time, surprisingly, that Elias has recorded that Jobim masterpiece. She has additional vocal assistance in the album from her daughter Amanda Brecker and the prolific Brazilian pop musician Ed Motta. Her bassist husband Marc Johnson does not solo, but his solid foundation is important to the success of several pieces, including “Some Enchanted Place,” an Elias composition whose lyric he wrote with her. Johnson’s lyric to her “Driving Ambition,” an homage toor maybe a spoof ofthe Beatles’ “Drive My Car,” incorporates a succession of rhyming words that lack profound meaning but help advance the song’s bossa nova rhythm and a series of interesting harmonic modulations. An impressive pianist influenced by Bud Powell and Bill Evans, Elias has continued to fashion her solos using increasingly sophisticated harmonies and judiciously timed silences. “Some Enchanted Place” contains one example, her short improvisation on “Searching,” another. This is the first album Elias has recorded in Brazil since she moved to the United States more than three decades ago. She set herself a challenge as producer, composer, arranger, pianist, lyricist, star and cover model. The result is a fine addition to her extensive discography. For his recording debut as a leader, guitarist and composer, Lima drew on his standing among colleagues in Rio de Janeiro to recruit veterans of Brazilian music including trombonist Raul de Souza, pianist Hugo Fattoruso, vocalist Ithamara Koorax and the godfather of Brazilian jazz, Hermeto Pascoal. His American guests are clarinetist-tenor saxophonist Anat Cohen, flutist Hubert Laws, vibist Mike Mainieri and arranger Don Sebesky. All-star considerations aside, the music is what counts, and the music is superb. Lima’s playing on several classical, acoustic and electric guitars is marinated in Brazilian tradition and leavened with the influence of Americans like Jim Hall and Pat Metheny. An admirer of Creed Taylor’s CTI label, Lima emulates CTI with Sebesky’s rich arrangement of Lima’s “Flying Waltz” featuring Lima, Laws and a string quartet. 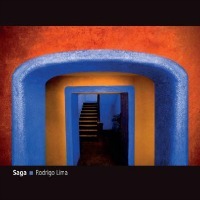 Saga’s cover photo is by Pete Turner, who provided many CTI cover shots. de Souza’s soulful trombone work is the solo heart of Lima’s and co-producer Arnaldo De Souteiro’s arrangement of the third movement of the Brahms Third Symphony. It recalls CTI’s adaptations of classical works. Mainieri, Lima and percussionist Sammy Figueroa also make notable contributions. The engrossing two-CD collection ends with “Nosso Borogodó Caió,” totally improvised on the spot by Pascoal at the piano and Lima on classical guitar. It is saturated in Brazilian spirit. 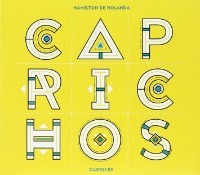 The focus of this two-CD set is De Holanda’s mastery of the ten-string Brazilian mandolin known as the bandolim. He is a wizard of the instrument, as he fully demonstrates in 24 caprices that he wrote. Seven are unaccompanied solos. The rest are duo or trio collaborations. Among the highlights is a breath-taking duet with harmonicist Gabriel Grossi on “Sky Caprice.” In “Spain Caprice,” De Holanda jousts with bassist Andre Vasconcellos and percussionist Thiago Da Serrinha. “Brazilian Caprice” is notable for turns of thematic surprise and Da Serrinha’s dazzling work with wire brushes. Accordionist Alessandro Kramer appears only once, in a duet with De Holanda on the lightning-fast “Waltz Caprice.” One track with a player this good isn’t enough. In a brief album note, De Holanda writes that his caprices are, “…poems of musical notes, instrumental songs that allow the pleasure of listening while simultaneously engaging the fingers in their technical development.” If you don’t have a mandolin handy for the pursuit of finger development, rest assured that De Holanda’s caprices give the ears and brain plenty of listening development. The tenor saxophonist takes the album title from Duduka Da Fonseca’s song and employs the veteran Brazilian in his rhythm section, along with bassist Nlson Matta, guitarist Guilhereme Monteiro and pianist Klaus Mueller, who was born in Germany but did much of his growing up in Brazil. The repertoire is replete with six pieces by Jobim and others by Brazilians including Matta, Ivan Linz and Johnny Alf. Allen’s affinity for Brazilian idioms and his proficiency in them has grown impressively over the years as he expanded his stylistic range. An indicator that he has moved solidly onto his own territory is the authority with which he claims “The Girl From Ipanema,” playing only one phrase that that echoes Stan Getz, the tune’s virtual patent holder among tenor players. Mueller stamps his Brazilian musical passport with his composition “Bute Papo” and his light, rhythmic, playing on it. 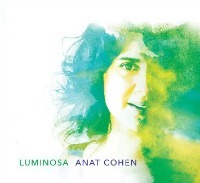 The tremulous quality of Maucha Adnet’s voice may be essential to the drama of the emotional effect she achieves in several songs in Portuguese, and Jobim’s “Bonita” sung in English. 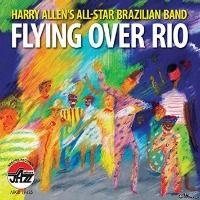 In this relaxed album, Allen sounds thoroughly at home with the Brazilian material and his Brazilian companions. Mendes capitalized on the bossa nova wave 50 years ago, captured extensive airplay and made his Brazil ’66 group a popular success. The pianist, arranger, sometime vocalist and fulltime impresario is still finding ways to build ear-catching combinations of instruments and voices over the samba beat. As always, Mendes embraces current trends in pop music and advances in recording techniques. 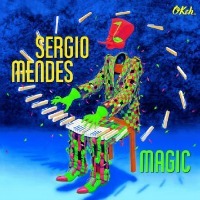 In Magic, he manages to assemble a cast with members as varied as the venerable Brazilian star Milton Nascimento, the rapper known as will i. am, former Weather Report bassist Alphonso Johnson, pop singer John Legend, the multifaceted Bahian entertainer Carlinhos Brown and longtime Mendes vocalist Gracinha Leporace (Mrs. Mendes). Leporace and fellow singer Alia Menezes tear it up on Mika Mutti’s lusty “Samba De Roda.” Nascimento is typically irresistible in his “Olha A Rua.” Mendes allots himself a short piano solo on Legend’s feature, “Don’t Say Goodbye.” The guest stars may be crucial to the kind of pop acceptance Mendes craves, but more of his playing would have been welcome. Thanks for the focus on Brazilian jazz…I’ve been a fan since 1963 when a non-believing jazz deejay in Bellevue, Washington, gave me a new Atlantic album he thought nobody would want to hear – “The Warm World of Joao Gilberto.” The rest, for me, is musical history. Still have that old 33 album which is much better than newer CDs of Joao to my ear. Nancy Curtin, a jazz vocalist in Portland, OR, is one of the best I know outside of Brazil with this music and she turned me on to the amazing vocalist Elis Regina who recorded several things with Tom Jobim. Your column is a joy every time it pops into my mailbox. .